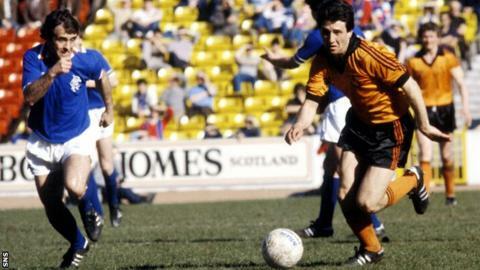 Former Dundee United and Manchester United winger Ralph Milne has died at the age of 54. He had been receiving treatment in hospital for liver problems. Milne helped Dundee United win the league championship in 1983, scoring the first goal in a 2-1 win over city rivals Dundee that sealed the title. "Ralph can now take his seat in the main stand on high alongside other departed club legends," Dundee United said in a statement. Inducted into Dundee United's hall of fame in 2009, he scored 75 goals in 286 appearances for the Tangerines. After moving south, he played for Charlton Athletic and Bristol City before a move to Manchester United in 1988. He made 30 appearances for the Red Devils, scoring three goals. Dundee United chairman Stephen Thompson said: "This is a very sad day. Ralph's skill and flair epitomised the Dundee United teams he graced and he was undoubtedly one of the finest footballers to hail from the city of Dundee. "He remains Dundee United's top goalscorer in Europe and I am grateful to have watched him in his prime many times during those fantastic years he starred for United. "It was a privilege to have known Ralph and he will be remembered fondly and missed sadly by Arabs everywhere." Former team-mate Paul Hegarty said he was a "wonderful" player. "Everyone remembers the two-three years he had at United when he was in fantastic form," Hegarty told BBC Scotland. "It's sad news what's happened to Ralph and obviously we're very upset and very sad. "Everyone remember his chip against Dundee for us to eventually win the league at Dens Park and I think that's etched in a lot of people's memories for ever more. "He had a lot of pace, he was strong, very gifted, and he's one of these players that fans loved to see. "I think Ralph would be the first to admit he should have had a better career because he was a gifted player, a talented player. But, for the spell he was at Dundee United, he was just a wonderful player. He had wonderful moments in Europe."